Your people are more effective when they share information and more productive when this information is available to them from any location, on any device. However, your corporate information is precious. You don’t want it to be placed on public file sharing sites, dispersed onto multiple devices with multiple versions, and being missed by your back-up routines. Codestone Cloud Drive – solves these issues. It enables you to combine server and cloud storage to cost effectively scale capacity. It allows you to control, secure and back-up electronic data, and it facilitates greater collaboration and productivity through file sharing and access from any location, any device. Codestone Cloud Drive is specifically designed to provide the capability to blend existing premise-based file servers and public and private cloud storage solutions – giving you the flexibility and scalability you need while making where a file is stored transparent to the end-user. When using Codestone Cloud Drive you gain the peace of mind that all of your critical data and files are securely backed-up and recoverable regardless of where they are being stored including desktop and mobile devices. This is complemented by the ability to deploy document version control. Full integrated with MS Active Directory, Codestone Cloud Drive enables access through normal user sign-on and to share and sync files from any device without the need for a VPN. Codestone Cloud Drive inherits NTFS permissions and as such there is no need to recreate access privileges. Codestone Cloud Drive uses industry best practices, tools and strong encryption techniques to securely store and transmit data. Not only is data encrypted with a unique key for your organisation, but also who accesses what, when and how if fully tracked and auditable. Codestone Cloud Drive is a Software as a Service (SaaS) solution, which provides you with a fully secure and scalable storage solution in the Cloud. It takes the complexity out of centralised storage by providing a single access control and management layer above physical storage. It is specifically design to provide you with the flexibility to blend existing premise-based file servers and public and private cloud storage solutions. It’s as easy to use as generic solutions such as One Drive and Dropbox, but unlike most solutions, it’s fully customisable storage with enterprise-grade security. Enabling greater mobility and collaboration in your organisations – sharing information and having this information available from any device in any location. The ability to scale the electronic storage needs of your business by blending existing servers with Cloud Storage and for this to appear as a single repository. Ensuring that all of your electronic assets are securely stored. Access is not only controlled but tracked, files are backed-up and full version control provided. 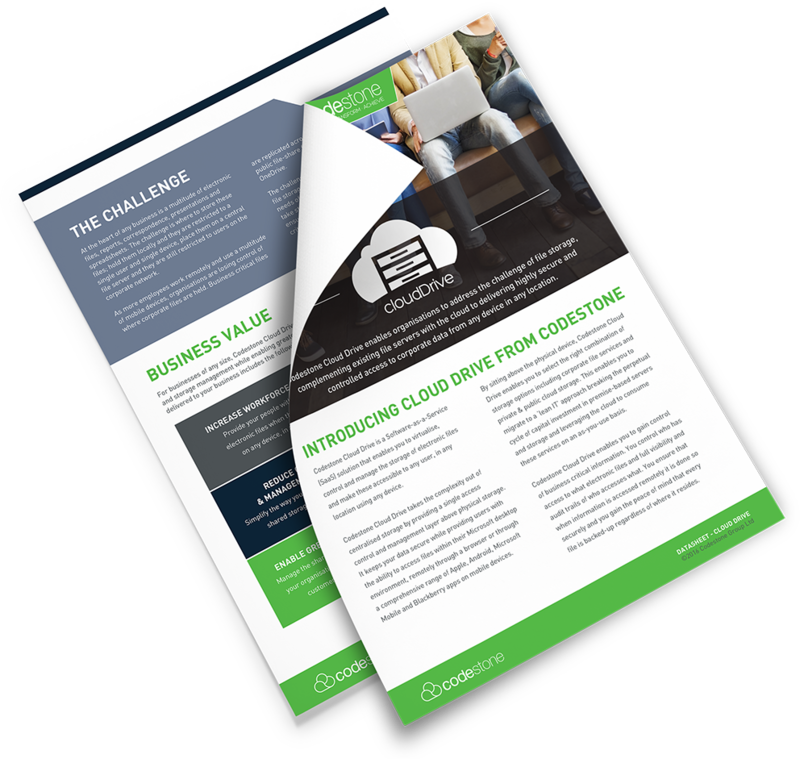 Discover more about Codestone Cloud Drive with our Datasheet outlining the key capabilities and value. Discover if Codestone Cloud Drive is right for your business by chatting to one of our experts.